I was out at one of our irrigation customer’s offices the other day and we were discussing all the aspects of their business. They position themselves as a “higher end” irrigation company, meaning they do large scale installs and service and also know that their pricing is higher than most of their competitors. They know that their techs are more experienced than many of their competitors and they also know that the work they do is quality work. Most of their customers know this and understand it, too. They’re willing to pay more for their services, because they trust that they are going to get the job done right and they will be taken care of long after their system is started back up for the year or after a sprinkler head is replaced. There was an article in Irrigation and Green Industry magazine recently about pricing. In the article, Jeff Carowitz, writes about how one of his clients had made the move to increase his hourly rates by 15%. It was a move they predicted might have lost them almost a quarter of their customers. What happened was….. They didn’t lose a single customer. While we weren’t discussing a price increase, there was something that stuck out about this point. I asked if they had ever “fired” customers before. They said that while it is fairly rare, they have. It wasn’t something they wanted to do initially, but some of their irrigation customers kept bringing up discrepancies in prices, had issues with the services they provided and were consistently calling in with complaints, it was worth it for them to let those people go. 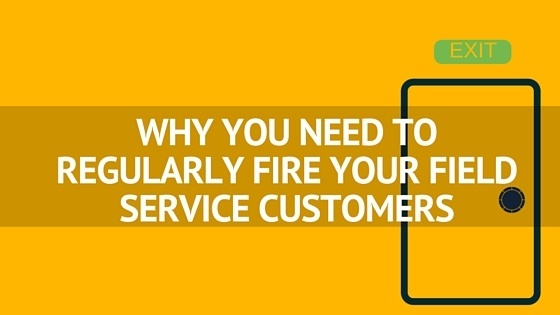 This isn’t to say that “customer service” should just go out the door, instead, firing bad customers enables you to better service your great customers. If you’re planning on positioning yourself as a field service provider that isn’t the cost leader in the area, people will price shop you. They’ll look for a lower price and wonder why you can’t do the same work for a lower price, like your competition can. If you have the experience, the customer service and do exceptional work, there is no reason for you to buckle to pricing objectives, especially if a large majority of your customers are perfectly fine with your pricing. Perform an internal audit each year. Are there any customers that stand out? Ask your office managers which customers are calling in with complaints more frequently than other customers. They’ll have a good idea of who they’re fielding calls from and who is causing the most issues for your business. Say, for instance, you have 500 regular annual customers. If you were able to say confidently that 1% of your customers were causing your business to slow down and that the other 99% were great customers, firing those five people would free up resources to better service the remaining 495 customers. When you’re letting these customers go, explain that you won’t be able to provide services the following year and that you would be willing to recommend someone who will. If you receive pushback, don’t be negative, judgmental or accusatory. Instead, give a one or two reasons as to why your business isn’t fitting their needs(if the customer has consistent issues on price, this might be a good time to recommend another contractor). Building a good book of business is just as important as having efficient field technicians, the best equipment or a great sales process. Remember that your customer base will be fluid. People will leave on their own accord, some won’t need your services anymore and some customers might get lost to competitors. It is natural. Be intentional on who you keep and who you decide to let go and your field service business will be better off. Want more tips for working with your field service customers? Download the free eBook 20 Ways to Improve Customer Loyalty now!